We'll try using a larger font size this report, as some have said it's been a little hard to read - let us know if any hassles scrolling across etc on smaller screens ? Rivers:- The high country rivers have fished very well over the last month , with a swing to hoppers in the last few weeks.Hopper fishing is great fun,and you only need to drift one along the steeper banks now to find a fish.Other patterns to have in your box at this time of the year include,yellow stimulators,royal humpies,royal wulffs, elk hair caddis, red tags,adams,klinkhammers and a few nymphs.Try fishing early morning through to mid-day and then again from around 6pm till dusk with the warmer weather. Lake Eucumbene:- The lake has now started to slowly drop , with patchy fishing over the last few weeks with the hot and variable weather. The key is to get on the water early , pre-dawn through to midday being best.The midge fishing has now thinned right out, with a swing towards hoppers,beetles,stick caddis and mudeyes into the night. There have also been a few nice browns sneaking around the margins on tad poles. The hopper fishing on Eucumbene should be great so long as it doesn't drop to fast over the next month. Select area's with plenty of grass down to the water and an of-shore breeze for best results. Catching a few hoppers first and keeping them in a container can also be a sneaky way of finding the fish a little quicker - just put half a dozen out on the water in the likely looking area's - If there's a fish in the area it wont take long to find it.You then need to get your hopper pattern out on the water in the vicinty as quickly as possible with out spooking the fish. The other trick worth practising is to try and "strip-strike" when you get a take with out lifting the rod to high. This will result in more hook-ups and less break-offs. If you also miss the take, your fly should also still be in the right visinity for another take if the fish didn't feel the hook. You may also come across some fish grubbing around on stick caddis and tap poles , so try these patterns if you don't get a look in on a hopper. The mudeyes have also really started to move over the last month, so try fishing a mudeye pattern either late into the night or again pre-dawn in the mornings, being the coolest times. Try patterns like , Cubbits foam mudeyes, muddler minnows, fur flies, craigs night times, tiahapy ticklers, mum's poodles etc . Jindabyne:- Not a lot of change this week. The mudeye fishing after dark has been quite good , so try and fish into the night or early in the little around area's with web beds when the margins are at thier coolest. The cool snap last week really improved the trolling, with some great reports back in over the weekend from both lakes.Generally the best fishing has been early in the morning from first light through to mid-morning. You will now do better using lead line and running downriggers , working down between 15ft and 40ft feet. Generally the best colours in the Tassie's have been Col S12,Y82,Y05, YFR ,89 & 55.Our own Alpine Cobras have also proven to be consistent fish takers in :- Alpine Special , alpine frog ,green ghost & pink bits all fishing well of late. The Sting cobra's from Tassie are also gaining quite a following with 16 unique colours now in our range.Minnows are also always worth having in your spread with RMG Scorpions in the new killer colour No 61 holographic crawfish , Stump Jumpers, baby merlins, Attacks and Rapala's all worth a swim. Best colours are gold & blacks, rainbow and browns trout patterns, tigers and pink/violets. The Merlin deep and Ultra deep minnows are one of my personal favourites, running between 3 & 4 metres on a flat line. Merlin Colours worth a try include the orange and green tigers, gold spots tail and yellow attractor.The Rebel crick hoppers also continue to fish well with the black one being the pick along with the Smilin jack version in black/gold. Running 3 colours of leadline can also help pull a few fish through out the day, getting your lures down around the 3 metre mark.We have also just received some great new colours in the Rapala minnow range with the "Muddler" , "Brown Muddler"and "Brook Trout" patterns looking fantastic ! The Rapala jointed shad raps have also gained quite a reputation for producing quality browns. We also carry a full range of the ever popular and proven Flat Fish , which seem to be making a come back - again ! 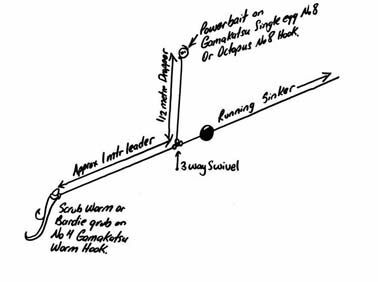 Bill Huber fished out from Buckenderra with 5 mates in 2 boats , using 3 colours of lead line and our own Alpine Cobra's in the black hole , along with tassies in Col 89 for 34 fish averaging .900 gms. Geoff & Andrew from Canberra trolled out form Anglers Reach using 4 colours of lead line with Tassies in Col 43 & Y48, Alpine Cobra's in the green ghost , bagging out ( 10 fish ) in 2 hours with rainbows averaging 1kgs.The boys commenting they where all in top condition as well. Anthony from Canberra fished flat lines early with F7 Flatfish in colours FR, Pink and PS for 2 rainbows and 2 browns to 2kgs. Andrew,Athol and Shane from Capt's flat (pictured above) cleaned up at Jindabyne on the weekend with 20 fish - 18 rainbows and 2 browns averaging 1kg.The boys trolled RMG Scorpions in the new Holographic gold crawfish, and tassies in Colours 55 and S12. It looks like being a blinder mudeye season this year with some great reports coming in from both Eucumbene & Jindabyne over the last few weeks. Just remember with this warm weather that the best fishing will be pre-dawn through to early morning as thats when the lake margins are at their coolest, and the fish will come in. The best way to fish these is with a water fill bubble float, using a foam/rubber stopper bead to set the depth you want to fish. The best hooks are short shank size 10 or 8 black octopus or suicide patterns, hooking the mudeye through the wing case behind their head. Drawing below - BUT feel free to ask how to set these up when your in . It's also always worth having a bait on the bottom, particularly through the day. The best rig for this is using scrubbies with a Power bait dropper (pictured below). This rig has really proven itself over the last few seasons; with both options you really have it covered. Power bait naturally floats, so the distance you make your dropper is the distance you can expect your Power bait to be above the bottom. This means that fish will find your bait a lot quicker even if you have cast into weeds. If they don't eat the Power bait they have found your main bait a lot quicker. Best colours in the Power bait have been Orange, Sherbet, Lime twist and rainbow. The hook is important when fishing with Power bait and we get a special "single egg" pattern in from Gamakatsu just for the job - which has a short shank and ultra wide gape. Feel free to ask us to go over the rig next time your in if still unsure.We should also start to see some better mudeye fishing on the lakes of an evening as things warm up.